← Here’s the Perfect Bike to Work Week Bike: It’s ready for Happy Hour! 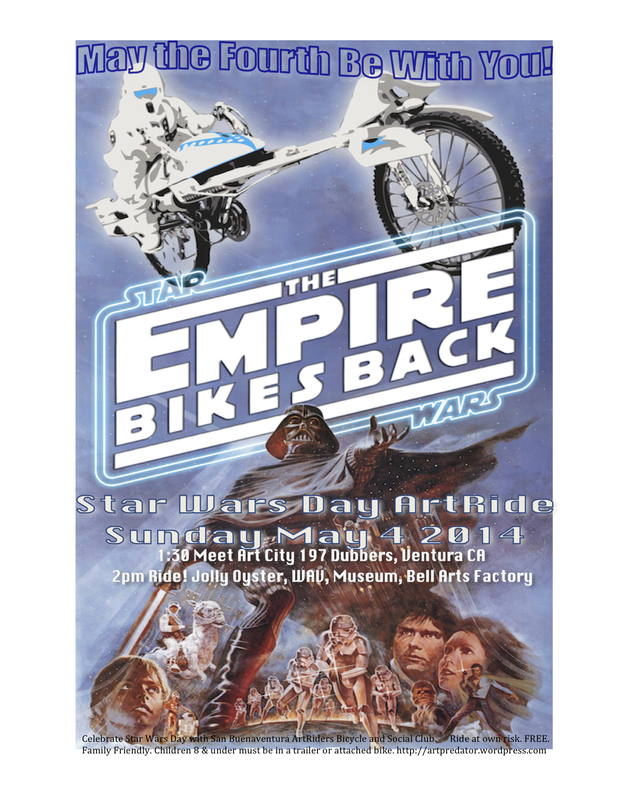 Please join the San Buenaventura ArtRiders Bicycle and Social Club for a Star Wars Day celebration! Free. Family friendly. Creative attire requested. Visit Art Predator for more details and to see photos from the 2012 ArtRide. bikergo gal aka Gwendolyn Alley aka Art Predator participates in monthly themed ArtRides to various art galleries and studios on the First Friday in Ventura. These free short rides are for fun and family oriented. Read more about themes on the RIDES page. We don’t have a permit for these rides because we rely on our right to peacefully assemble. When we ride we become traffic and abide by the laws of traffic. 3. Obey all traffic laws. We’re out to generate goodwill for cyclists and cycling, and to have a great time! Smiles and waves are so much more joyous than getting and giving grief! Whether you dust off your old cruiser or bring out your pricey pride and joy, we ride because we like to get people on their bikes and to have fun. It’s even more fun if you dress up with us, but that’s not a requirement. If you’d like to join us on our next social on wheels, bring your bike to the Ventura Beach Promenade by the Artists Union Gallery 330 California Street. We meet up at 5:30pm and ride by 6pm. We ride until about 7:30 or 8pm when we often gather for food and more merriment. Rides are free. The latest information about upcoming rides can be found in posts on this blog and on the page titled RIDES. Roshi Egyoku: Embrace Not-knowing. Trust your awakening.